The chicken round-up…a competitive, down and dirty, sweaty sport played on our farm. Those ladies know how to stagger and dash quicker than an NBA point guard headed down the arena floor. Recently I agreed to participate in a little early morning one-on-one with one of the fab four as she had made her way across the road into land untraveled- by chickens. Dressed in work clothes and pulling out of the drive, I spied the little feathered adventure seeker as she victoriously strutted and pranced not knowing what danger waited silently nearby. I pondered for a moment…looked at my high heels and just for the briefest of time…thought to let her go and see what happens. But I then quickly decided to take up the challenge as she was way over her head in this. The round-up was on. Her three squawking cheerleaders poked their heads through the fence line and chanted incessantly as they watched my approach. We engaged in a few moments of “run-n-grab” before I knew I needed to change tactics. We stared at each other not daring to flinch. And then…in one big swoop I had her in my hands. Her wings were fluttering and the cheering section was agog with bawks and cackles. 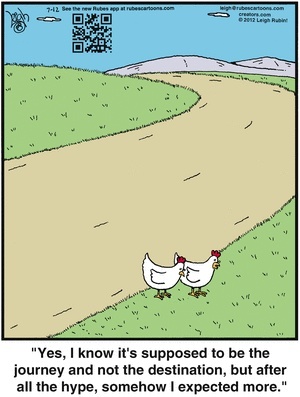 I returned her to the safety of the big green pastures and open fields and I dared ask the age-old question….”why did the chicken cross the road…?” She never answered me.